Deruta & Orvieto We started our day at a family ceramic factory in Deruta. Every step of the process was demonstrated. Like all other parts of our tour, this stop was truly an experience of life in Italy without any pressure to make purchases. The tour guides for finding places that offer cultural and educational experiences without a hint of sales pressure. The best way to show what goes on behind the scenes is with a short video that we took during the tour, on the process of making ceramics. These were beautiful and we selected them to help us remember this part of the trip. The company packed our ceramics. They arrived in perfect condition. Although the coffee tasted better in Italy, when we drink coffee from these mugs, they continue to bring back pleasant memories. In 1857, the city of Orvieto sold the estate to the family Felici and it became a prestigious winery. The Etruscans dug caves on this property in the seventh century BC which are are still in use today. The underground caves provide optimal conditions for fermentation and storing of wine. Over the years, there have been many owners of this property including the Vatican. During this period, the Etruscan caves were enlarged and became a safe haven and place of worship for the first monks.Roots from the trees above are seen growing through the ceiling of the cave tunnels. After a tour of the winery, tunnels, and vineyard, we were treated to a feast of local foods and wine. After lunch at the winery, these two started scheming about helping Aaron find his “Stephania” (based on an old Everybody Loves Raymond episode). In Orvieto, Art explained to Aaron the importance of looking good and having proper posture on his ride. Walking around the shops in Orvieto, Aaron practiced his moves. In the end, Aaron got what he expected from following Art’s advice. No Stephania. Lynette on the other hand was out on the streets of Orvieto on “Market Day”. With other tour buddies, she was eager to get in on those special deals we had read about. “Perfect for the table back home” and not made in China. By this part of the tour, Aaron’s hair was getting longer and curlier and people often thought he was “Roman”, much to his delight. Nina told us not to miss the “Panino con Porchetta” and to order it “Magro” for lean. Just porchetta on a fresh roll, no condiments. Just seeing this picture still makes us hungry. Next we’re off to the tiny town of Civita di Bagnoregio. Sometimes called the dying town because of its slowly decreasing size and winter population of 9 permanent residents, this city without autos proved to be a highlight of our tour. Shown in the picture below is the city in the background and the long suspension bridge that leads to Civita. Whenever possible, we tried to take Rick’s advice to get off the regular path and talk to the locals. 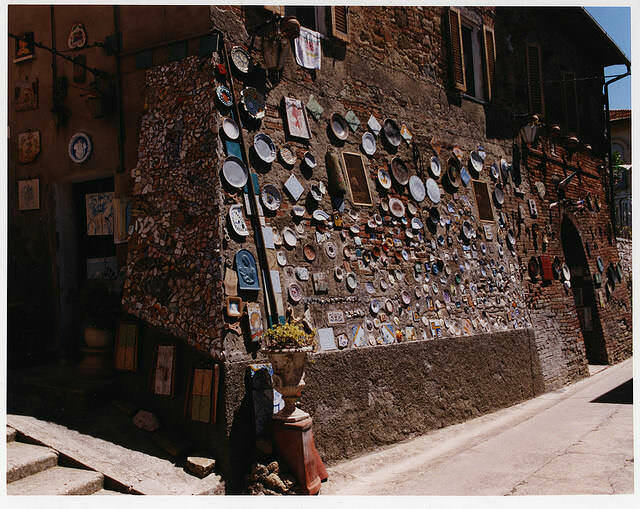 Art talks to Maria, one of the local residents of Civita, and finds out that she is somewhere in her 90’s. For a donation of a Euro, you can visit her private backyard and garden and get to see a view from the hill top. Our last night in Orvieto – romantic Italy at its finest with a calm, crisp evening and a full moon.